Thursday, September 19 1907 -- George Memsic is training for his fight with Joe Gans. 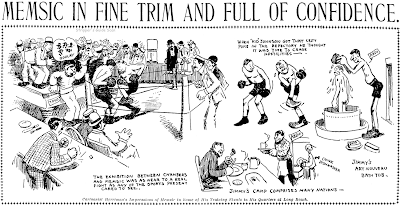 If Herriman's depiction of Memsic's camp boxing ring looks a little off-kilter, don't blame the cartoonist. The makeshift training facility was too small and the ring had to be abbreviated into a sort of triangle shape. William Hamilton Cline, a local press humorist whose only notable credit seems to be that he translated a book of Russian short stories. He was active in L.A. from the 1890s to at least the 1920s. William J. Lampton, Kentucky-bred humorist and poet, he worked for the New York Sun. He died in 1917. 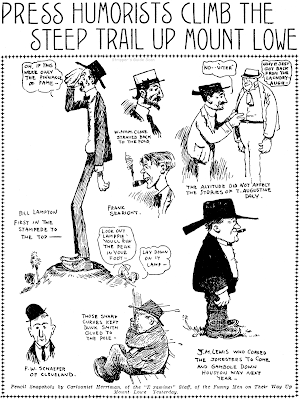 Fred W. Shaefer, the only fellow depicted with a cartooning background, he did the writing on several comic strip series for NEA in the 1910s. He was a Cleveland staple for decades. T. Augustine Daly was one of those dialect poets who proliferated in the era. He specialized in Italian and Irish-accented verse. Frank Searight, president of the APH, seems to have as his most notable achievement writing a lurid account of the Great San Francisco earthquake. It was rushed to press and sold briskly as a cheap paperback. I can't find any information on J.M. Lewis or Dunk Smith. Hello, Allan----Duncan ("Dunk") H. Smith was a member of the Chicago Press Association. He seemed to be primarily on the organization side of things, and delivered an occasional address on it's behalf. He was also a socialist, considered so radical that he was expelled by one faction of that group. His wife was also very involved in the Chicago women's suffrage movement.----Cole Johnson. is not so far removed from his subject. He finished at the University of Missouri in 1948 after an Army stint interrupted his studies. Anti-study, and regularly mooching off his freshman roommate, Beetle turned up first in the Saturday Evening Post about a year and a half ago. 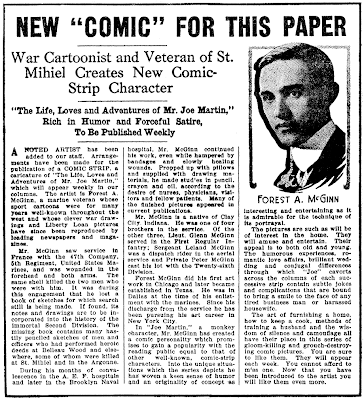 The advice of the Satevepost cartoon editor: "Draw what you know" resulted in more of the same, and eventually, the comic strip. With a locale of Rockview University, the strip may cause waves of nostalgia among Missouri grads who will recognize "the Shack," student hangout made out of an old railroad car, and other spots. The 26-year-old cartoonist calls his background authentic collegiana: he's made a study and they all have equivalents of the shack; ivy, arbored walks, etc., he says. Characters or composites of characters he's known people the feature in his effort to achieve life-likeness, says the artist. A basic realism pointed up with satire and slapstick humorous poses, and universal situations are some of his goals. The cartoonist seems to have been something of a child prodigy in his field. He sold his first cartoon at 11 to Child Life magazine. At 14, he sold to Inside Detective, Flying Aces and others. 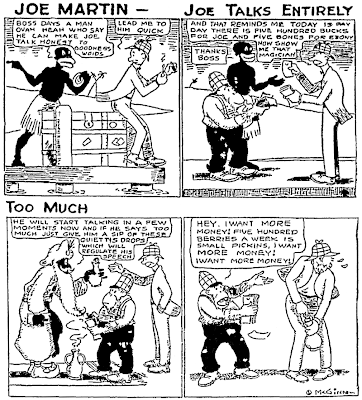 At 15 he drew a once-a-week comic strip, "The Lime Juicers," for the Kansas City Journal for 20 weeks before the paper's demise. At 16, he was an editorial designer for Hallmark cards. An attempt to major in journalism at college was foiled presumably because he lacked the proper courses for the first two years. But the cartoonist darkly hints his post as editor of "The Missouri Showme," humor magazine, probably considered the outhouse of journalism, had something to do with it. Coming to New York in 1948, he began selling gag panels to the big magazines: Satevepost, Collier's and This Week, among others. Almost painfully interested in verisimilitude for his strip, Mr. Walker admits pouring over old annuals, "Showme's" and other mementoes in an effort to recall the flavor of those salad days. His wife Jean, who was a classmate, helps on ideas. Both cartoonist and syndicate feel the strip has comic appeal that goes beyond the ivied walls. Says King comics editor Sylvan Byck: "We think teen-agers will like it as well as adults who have kids in school now, had kids in school or are just plain interested in kids. The fact that the characters are in college is interesting but incidental. 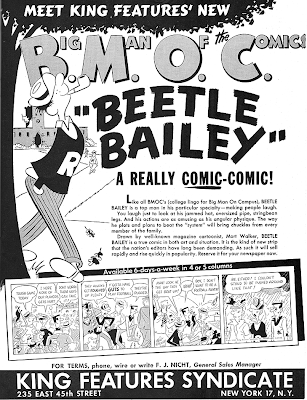 The humor has general appeal"
I know that the size and style of comics have changed over the years, but I often miss the kind of art that characterized Beetle (and later Hi and Lois) back in the 50's and early to mid 60's. Here's one to celebrate the withdrawal of our troops from the cities of Iraq. Congratulations, guys and gals of the military, for getting one giant step closer to coming home! Betcha didn't think I could come up with a strip set in Iraq, eh? Little Bill and Ben of Babylon was by a fellow who signed his name 'Hampton'. You've gotta give this guy props for coming up with a very unusual spin on that tired old Katzenjammer formula. His two little finks were in ancient Mesopotamia. 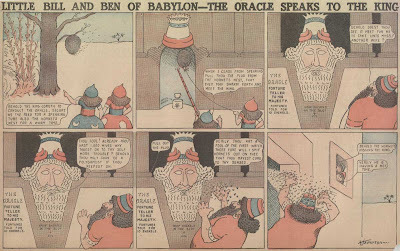 I particularly like the strip where they take over an oracle to perform one of their stunts -- you just gotta believe that some mischievous kids might have actually done something like that back in the day. The feature ran in the Philadelphia North American from June 6 to August 26 1906. It's the only strip that Hampton ever did for the North American. I have a guy named Hampton signing one other feature in the New York Journal in 1908, but no other clues to his identity. Thanks again to Cole Johnson, supplier of todays sample strips! I have to confess, unlike some of thse entries in your Obscurities, I really like this one. If I were reading this way back in 1906, I'd be a fan. I can see a certain amount of Winsor McCay here, but by no means was Hampton a shameless mimic. Seeing the way he moved his point of view around in the lion hunt strip is amazing, when you stop to consider that films of the time were just beginning to do that. Cool. I love the mix of Middle English and "modern" terminology ("Verily his range finder was out of order"). The art is great fun, too. Any idea why it only ran for three months? This is really funny! I'd love to see more. I like the coin slot. It seemed to be purely a fill-in strip, thrown in when the North American experienced a turnover in their cartoonist stable. 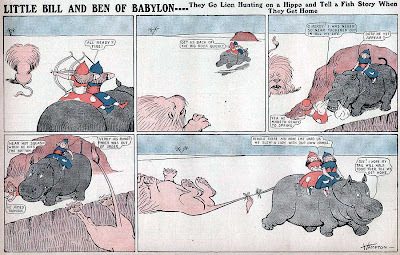 Only nine strips were published, and it was replaced by the always prolific W.R. Bradford's Almost Family. We tend to think of Gus Mager as the king of the monks in the oughts and teens, but he did plenty of series featuring other animals, and even (gasp!) humans on occasion. Here's one of his least memorable efforts, Louie and Franz. This pair of German-accented bears (they are bears, right? It can be hard to tell with Mager) had nothing special going for them. The two buttinskis get comeuppance for sticking their noses in touchy situations. Not much ha-ha there. It's amazing what slight effort was expected in a strip in those days if you were using dialect dialogue. At this late date we can only assume that since this sort of base humor proliferated on the comics pages that it was in fact entertaining its audience. Today even if we make allowances for it and don't take offense it is often impossible to detect even the barest bit of humor. 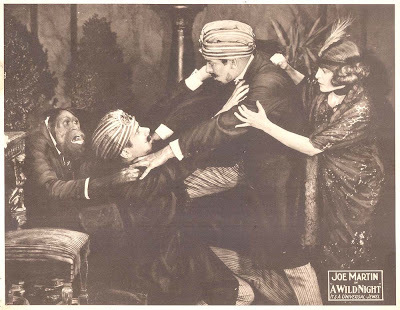 Louie and Franz ran in Hearst's New York Evening Journal from December 23 1904 to January 3 1905. It appeared just four times. "What? I'm having a heck of a time trying to figure out what to draw next. Leave me alone! "I've got a sure-fire idea. 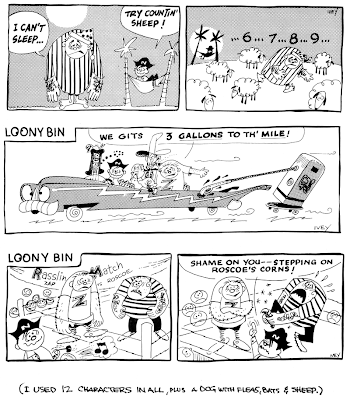 Why not take two things that the readers love - the Katzenjammer Kids and talking animal strips - and combine them?" "Yeah, sure. Why not? If it bombs, in a hundred years no one will care anyway." ... and use Maud the mule, too. Comedy gold! Oh yes! Maud! Should have seen that one! And by the end of the run, did they have the German Bears waking up from a saurkraut dream too??? Nah, they were paddled by Mr. Jack and posted a resolution that they would be better bears in the future. In the halcyon days of silent comedy, among the funnier stars were the animal comedians. Among others, there was Brownie the dog, Max, Moritz and Pep, the monkey trio, Snookie the chimp, Billy Whiskers the goat, Cameo the cat, even Sally the horse. One of the most famous was an Orangutan given the monicker "Joe Martin". 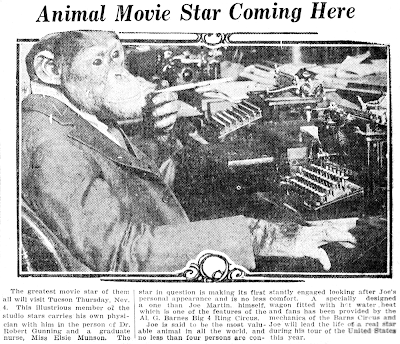 He was heavily promoted by Universal pictures as the "smartest animal in the world", and as being the "closest an ape can be to being human". 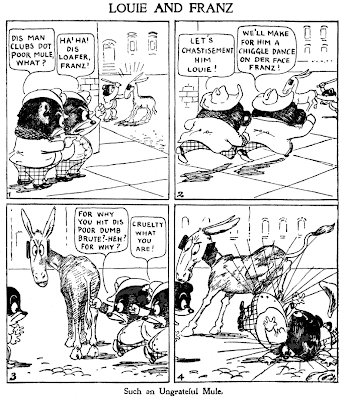 They embarked upon a series of slapstick shorts in 1919, with titles like The Jazz Monkey and A Monkey Prohibitionist. They became so popular, a sub-series with a female, "Mrs. Joe Martin" were made. 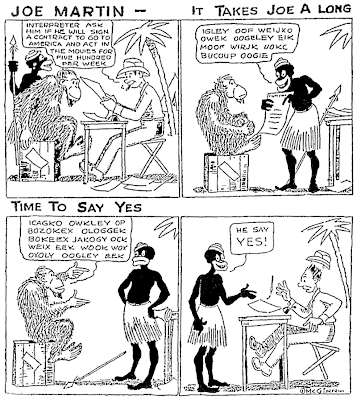 In 1920, a comic strip was inaugurated starring the simian star. Here's the announcement for it, with a brief bio of the artist, Forest A. McGinn. The newspaper it appeared in, Farm Bureau News, ran only this blurb and the first episode! The rest of the Joe Martin story isn't very pleasant. Far from being the wonderful animal he was painted as, Joe was actually quite unpleasant to work with, going through unpredictably aggressive periods of behavior. A couple of episodes in which he got loose and went on destructive rampages even made it to the newspapers. Once, he broke into a house and destroyed it, in an hours-long bender in which the police had to intervene. Fellow Universal comedy star Diana Serra Carey in her memoir, Whatever Happened To Baby Peggy? tells of the horrible end of Joe Martin. The ape had gone berserk again, and had taken a vicious bite on the arm of trainer A.D. Steckler's wife. In a blind rage, he brained Joe, tied the unconscious ape to a prop dentist's chair set up for a comedy to be filmed, and pulled out every tooth of his head. Someone at the studio did the most humane thing, and put a bullet in the monkey's head to end its suffering. A January 1924 news article tells of how Joe Martin was getting too hard to control, and was sold to the Al G. Barnes circus. The last Joe Martin comedies were released that month. Here's a clipping from the 10-24-26 Arizona Daily Star (Tucson.) It's another monkey, using the franchised Joe Martin name. 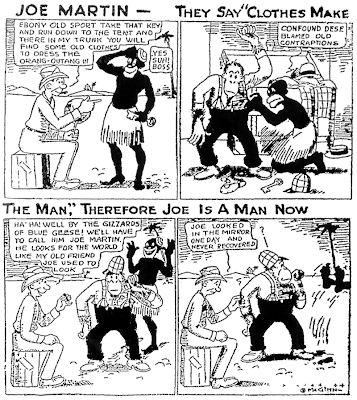 Today there doesn't seem to be any Joe Martin comedies that have survived. However, he can still be seen briefly in Seven Years Bad Luck (RC 21) , a Max Linder feature. Wow, the story of Joe Martin really is horrendous and inhumane. I would say that the abuse didn't begin or end in the dentist's chair, and that if Joe was hard to deal with, he may very well have had a darn good reason for it. It's my understanding that mistreated or not, apes in such situations get completely unmanageable once they reach maturity. The frustrations, social and sexual, of not having interaction with other apes makes them a real handful. Is it possible that the Joe Martin strip didn't go anywhere because it wasn't licensed, and the studio put McGinn out of business? Didn't anyone notice that when "Joe" visited Arizona, he was no longer an Orangutan, and now a Chimpanzee? What could be the reason offered? Movie special effects? As Cole Johnson said in the text, by that time it was a replacement ape. Joakim Gunnarsson has discovered this strip was reprinted in a old Swedish movie magazine. Amazing!